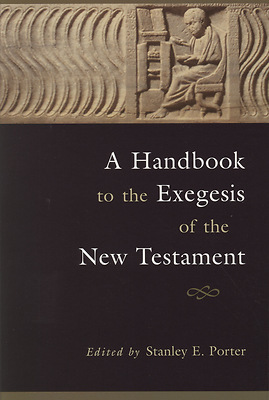 "A Handbook to the Exegesis of the New Testament is a substantial theoretical and practical guide to the multifaceted discipline of New Testament exegesis. This volume covers current topics in New Testament exegesis in sufficient depth to provide a useful methodological basis. The introduction includes an analysis of the various definitions of exegesis, a term notoriously difficult to define, and a bibliographic essay covering the basic tools of exegesis. A section on method includes detailed discussions of the different models used in the major approaches to exegesis: textual criticism; linguistic analysis; genre criticism; source, form, and redaction criticism; discourse analysis; rhetorical and narratological criticism; literary criticism; and canonical criticism. Also included are models based on analysis of the backgrounds of the New Testament in Hellenistic philosophy, ancient Judaism, the Roman Empire, and the works of second-century authors. In a section on application, exegetical methods are applied to the various literary units of the New Testament. This handbook will serve well as both a textbook and a reference book for the major tools and topics in the area of New Testament exegesis. Please note that "A Handbook to the Exegesis of the New Testament was previously published by Brill Academic Publishers in hardback, ISBN 90 04 09921 2 (still available).